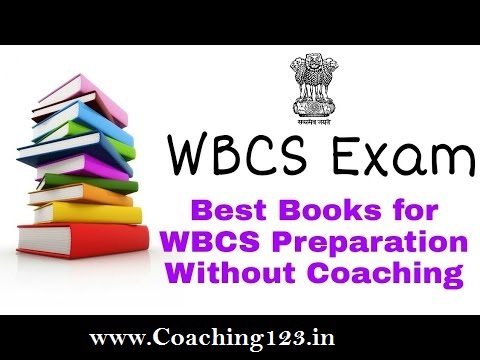 Best books to Crack WBCS Exam - Hey friends welcome to www.Coaching123.in > one stop destination for govt jobs coaching and preparation. Here in this website we generally provide govt jobs exam notes like SSC CGL, SSC CHSL, SSC MTS, RRB Rails, IBPS Clerk, IBPS PO, and other state and central level govt jobs competitive exam. We have also started a new initiative to provide notes and study materials related to WBCS (west bengal civil services). We have also published the CLASS 1 for WBCS, for which we have received a huge response and likes. That's why we have decided to put a new column/section for WBCS in this education portal i.e. www.Coaching123.in ! If you have missed the CLASS 1, then you can read it here > Click here. In today's class we will be discussing about some of the best books for WBCS exam, for both prelims and mains exam. So, if you are a WBCS aspirants or planning to start the preparation from the root, then this class will be very helpful for you! So, let's start today's class ! Hope you all already knows the full WBCS exam pattern. But once again let me clear the important subjects related to WBCS exam for both prelims and mains. Whether you are preparing synonyms, antonyms or homonyms, or one words substitution or idioms phrases; this book is the best for the WBCS prelims. As we all know that the WBCS mains exam has some descriptive part with questions from essay writing, editorial letter writing, precis writing, or report writing; therefore this book is enough for this stage. 2. Mains - For mains you have to read thoroughly Jeevan Mukhopadhyay and History Krishna Reddy. In the History Krishna Reddy book, the MCQ section in every chapter is very crucial. Because this MCQ part covers 45% questions. In geography, for prelims you can read the Indian and West bengal geography book by Kartik chandra mandal. For the mains part you can read the previous book i.e. Kartik chandra mandal and for advance study you can read either Geography by Majid hussain or Geography by Khullar. With this you must follow the ATLAS (world+india+west bengal) for charts and maps ! For prelims and mains; Indian economy by Ramesh singh is the best. For the mains economy part you can get any IBPS study material to cover the RBI, SEBI and other banking financial awareness part. With this you can also follow the NCERT class 11 and 12 economy book. For this subject there is one and only book in the market i.e. Indian polity by M. Laxmikant. Just read this book thoroughly 2 to 3 times as you have to cover constitutional articles, parts, amendments, laws, cabinet ministers, politics, etc. This book is often called as 'Bible of Indian polity' !!! For Science there is no particular book. The best idea will be to read NCERT books from class 8 to 12. For the mains part you can prefer Science books by S.Chand or the Science MagBook. But you must cover the NCERT books thoroughly !! Generally in WBCS basic Maths level questions are asked. Therefore, Maths Objective Arithmetic (R.S.Agarwal, S.Chand) is enough. For this section, The Reasoning R.S. Agarwal book is enough. In the WBCS mains, the environment section has also become a crucial part. For this you can read the Environment by Shankar IAS. It will cost you approx Rs.300/-. You can download it FREE from this link (129 mb) - Click here. For daily current affairs no need to purchase any magazine or books. Just follow these online portals. Hope you have liked this list of Best books to Crack WBCS Exam. So, finally its time to set the clock. On your marks, get, set and Gooooo... !! Best of luck! Happy preparation! For daily classes and online coaching for WBCS, SSC CGL, IBPS and other state and central level govt jobs exams, visit us again www.Coaching123.in !!! If you liked this article, then do share it. Sharing buttons are given below!